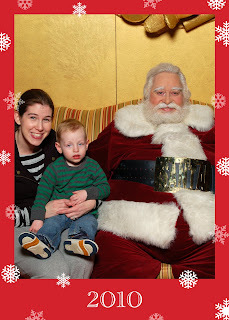 On the way to meet Santa, Ben was saying "Ho Ho Ho" and showing me how he was going to smile for the camera ("cheeeeese"). I was so excited to be taking him to see Santa this year now that he was going to understand a little more. Boy, was I disappointed. As you can see, Ben looks terrified. I had to be in the picture with my sweat pants and ponytail (Ben wouldn't sit without me). To put the icing on the cake...do you notice something wrong with Ben's feet? A mom of 2 years and I put his shoes on the wrong feet? Hmm. I'm soooo glad I bought this picture to capture this moment. HA! Please tell me that that Santa is a statue.